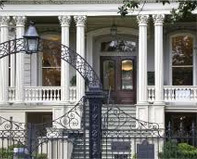 We offer regular New Orleans Garden District vacation packages that vary from time to time. Be sure to check back often for our current specials. Run away from busy and escape to romance in the unforgettable and unique city of New Orleans. 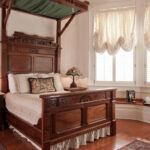 Grand Victorian Bed and Breakfast is just the place to experience a memorable stay neither of you will forget. The rate for this sensational special is $450 per person + tax, based on double occupancy in a Deluxe Room. Guests can also opt to upgrade this package from a deluxe room to a Suite for $500 per person + tax, based on double occupancy. All packages are subject to availability. 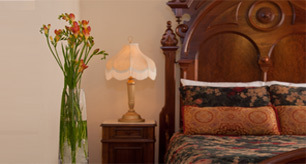 When you book directly with Grand Victorian Bed & Breakfast either online or by phone you are automatically enrolled in our Frequent Stay Program. For every five visits, regardless of the length of your stay, on the sixth visit we will give you one free night! * Rooms booked through third party online retailers, such as Expedia.com, Orbitz.com, Travelocity.com, Hotels.com, Booking.com, Priceline, etc. are not eligible for free nights. Come to New Orleans and explore the Garden District neighborhood featured in “The Curious Case of Benjamin Button,” the blockbuster movie filmed 3 blocks from the Grand Victorian. 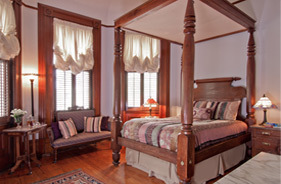 3-night stay in a deluxe guestroom with period decor. $100 credit at the famous Commander’s Palace Restaurant, a block and a half walk down the street from the house. 3-day RTA pass for unlimited rides on public transportation (streetcars & buses) to the French Quarter and all other venues in New Orleans. $432 per person + tax, based on double occupancy in a Deluxe Room. Upgrade to a Suite for $525 per person + tax. All enjoyed in luxurious Grand Victorian style with: Private & modern bathroom, individual temperature control, TV, ceiling fan, robes & slippers to use, iron & ironing board, hair dryer, and modern room amenities. Extended continental breakfast daily, which can also be enjoyed outside on the balcony. Free snacks and bottled water 24/7, Free parking, and Wi-Fi. 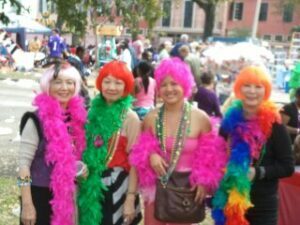 Mother’s Day, FestiGals, spring break and college visits are all great reasons for a girls only getaway to New Orleans with great food, toe-tapping music, and a little bit of pampering. For a quieter day, pack a picnic lunch and take it to City Park, one of the lushest and largest urban parks in the country. 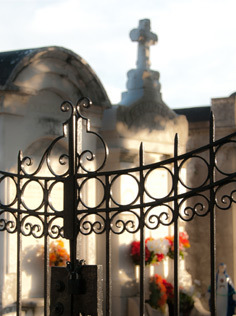 Take a walking tour of the Garden District’s many historical homes, gardens and cemetery. Afterwards, treat yourself to a facial, a massage, or even a pedicure at one of New Orleans many relaxing spas. Two passes to the Audubon Zoo, accessible by streetcar. All enjoyed in luxurious Grand Victorian style with: private & modern bathroom, individual temperature control, TV, ceiling fan, robes & slippers to use, iron & ironing board, hair dryer, and modern room amenities. There is an extended continental breakfast served daily, which can also be enjoyed outside on the balcony. Free snacks and bottled water 24/7, parking, and Wi-Fi throughout the house. We would be glad to help you make your stay even more luxurious; ask about arranging a gift certificate to the local day spa or a picnic basket for your day a the park. ** All packages are subject to availability. Special events and some city-wide convention periods are excluded. Early booking is recommended, and you must mention the particular package when making your reservation. Room selection is based on availability at the time of booking. If the package includes a restaurant, reservations are based on availability there, subject to change without notice, and we reserve the option to change the venue if necessary. Taxes are 13% +$0.50/night. Transportation to any portion of the package is not provided. No specials can be combined with any other discount or special rates. If you would like to order any of our packages online from this Web site, simply go to the "Availability" tab on the Toolbar, enter your travel dates, select your room and book your reservation. When entering your information, make sure you mention the package you want in the "Special Needs" section. This way, your confirmation email will reflect the entire package and not just your room. 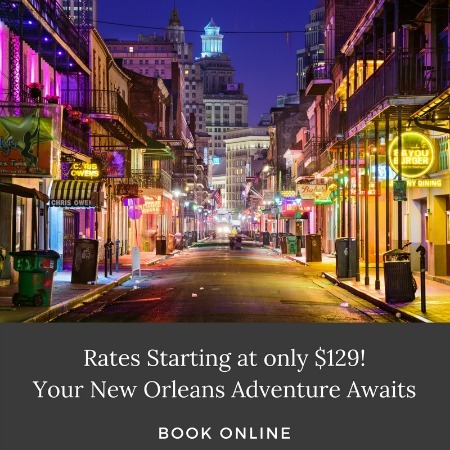 Why go to flashy Las Vegas for your destination wedding when you can come to romantic New Orleans? Step into the city’s rich past at one of these historic New Orleans homes. Visit some of the nation’s oldest, still-standing examples of original French, Spanish and American architecture. 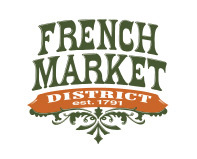 For over 200 years, the historic French Market has been an enduring symbol of pride and progress for the people of New Orleans. Open daily - Retail Shops: 10am - 6pm & Farmers & Flea Market 9am - 6pm.